This is a first for Saturday spotlight . . . I'm highlighting the craftiness of someone I don't know. Although I didn't plan it, my posts this week had a common theme. See if you can guess the theme. On Monday, the girls and I used toilet paper rolls to make rain sticks and binoculars. And on Thursday, I finally made a craft for myself, a friend and a giveaway - a travel roll-up. Yep, that's right. Both posts find their common bond it some kind of roll. 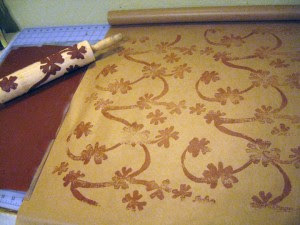 I felt compelled to use my Saturday spotlight to continue the theme, and I found this amazing idea Amy at Craft Chi for making a unique print with a rolling pin. Super creative! Actually, I plan on trying this tomorrow night for our kids' craft night. I'm going to make it a bit simpler for kids to do by using foam stickers that we have on hand. I look forward to posting about our attempts tomorrow night. Stay tuned and . . .
That is so cool! Ha, ha, you are 'on a roll'! What's next...cinnamon rolls? Roller skates? Rollers in your hair? Endless possibilities, but I think then you'd have to change the name of your blog! Very fun! Love this idea!